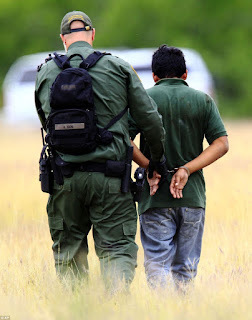 GUEST BLOG / By Maya Srikrishnan, staff writer Voice of San Diego--A Chula Vista high school student was charged last week with recruiting classmates to smuggle drugs from Mexico into the United States. Separate charges were brought against another San Diego man for recruiting high school students at San Ysidro High School to do the same. Authorities caught five teens in one week smuggling fentanyl across the border back in March. It’s part of an unsettling trend that, according to Customs and Border Protection, began around 2009, in which criminal organizations recruit teenagers to smuggle drugs and people because they believe they’ll be less scrutinized. The pattern has reached new levels of urgency as teens are being recruited to smuggle increasingly deadlier drugs across the border. Most recently, the agency has seen a surge in teenagers with fentanyl strapped to their bodies. “Fentanyl as a whole across San Diego has gone from a minor amount in 2016 to a steady increase,” said Ernie Verina, supervisor and assistant special agent in charge in San Ysidro for Homeland Security Investigations. Fentanyl smuggling has gone up, in general, he said, which is likely why we’re seeing more teens try to cross with the drug. Fentanyl is a synthetic opioid, with roughly 50 to 100 times the potency of morphine, according to the Drug Enforcement Administration. The potency has led to a significant increase in overdoses and overdose-related deaths. Fentanyl can be absorbed through the skin or inhaled, meaning a ruptured package strapped to someone’s body could mean exposure to the deadly drug. “This is dangerous and not worth the risk to one’s life through unintentional exposure,” De Cima said. In the past three years, CBP’s San Diego office has made hundreds of drug seizures from minors crossing the border, reaching 256 seizures last year of mostly methamphetamine. Teens can be offered anything from $100 to thousands of dollars, depending on the situation and what they’re smuggling. It’s important to look at the cross-border teen experience to give some context to this group of children. These are teens who often fall through the cracks and may be at risk for recruitment by criminal organizations. While not the case in every instance where a teen is smuggling illicit substances across the border, the transactions often involve schools in some way. Most of the recruiting is happening at U.S. high schools, Verina said. Many of these kids live lives on both sides of the border, crossing either for school or to see family. It’s hard to get a solid number of how many students in our binational region cross daily or weekly, for a variety of reasons. Public schools, for instance, weren’t allowed to enroll students who didn’t live in the country until a new state bill passed last year allowing the practice in the case of a parental deportation. That meant many of these students wouldn’t share their transborder situations with their schools. But we know that there are likely tens of thousands of them. Melissa Floca, an associate director of UC San Diego’s Center for U.S.-Mexico Studies who has been researching this student population, shared some statistics with me. • Of the more than 500,000 U.S.-born children who are now living in Mexico, one in 10 is in Baja California. • At San Diego Unified and Sweetwater High School districts, roughly one in five students has spent time being educated in Mexican schools. • In Tijuana, one in 10 students has spent time in U.S. schools. Not all of these students cross the border daily, but we know that tens of thousands of them do, Floca said. Students who have cross-border lives face unique challenges. Last week, a Senate Select Committee on California-Mexico Cooperation hearing in Sacramento took a look at the educational issues faced by transborder students. Floca told me that these students fall through the cracks for many reasons. Their home situation — perhaps a parent has been deported — and the realities of their hours-long commute or adjusting to life in Mexico can make students depressed, exhausted or stressed, which can lead to them not being engaged at school. The students often struggle in both languages, in schools that don’t have good bilingual education programs or bilingual teachers. They may be able to use Spanish and English conversationally, but struggle with writing or reading well in both languages. Then there are the administrative problems. Students can only take exams required to enroll in schools in Baja California once or twice a year, so depending on when they move, they might have to spend months crossing the border to continue school. Or they might just stop attending for months. For students who spend time in Mexican high schools, they often have issues transferring credits to U.S. schools to help them meet graduation requirements. These factors can become barriers that keep them from being engaged and successful, both academically and socially, at school. At worst, they can increase the students’ likelihood of dropping out. Several agencies, including the San Diego County district attorney’s office, CBP, Homeland Security Investigations and other school and community groups are working to bring more awareness to teens about the dangers and consequences of drug smuggling, particularly with deadly fentanyl, through public service announcements and presentations at schools. ARTICLE: CROSSING THE BORDER TO SCHOOL: CLICK HERE.